After completing the third grade, a Cub Scout graduates with ceremony into a Webelos den. This is a special den for boys in the fourth or fifth grade (or who are 10 years old). The Webelos Scout program is more challenging to the older Cub Scout. The scout is now called a Webelos Scout and wears a different Webelos Uniform signifying his new status. The scout works toward earning his Webelos badge. In addition, he can earn 20 Webelos activity badges: Aquanaut, Artist, Athlete, Citizen, Communicator, Craftsman, Engineer, Family Member, Fitness, Forester, Geologist, Handyman, Naturalist, Outdoorsman, Readyman, Scholar, Scientist, Showman, Sportsman, and Traveler. The scout can earn 20 Webelos activity badges: Aquanaut, Artist, Athlete, Citizen, Communicator, Craftsman, Engineer, Family Member, Fitness, Forester, Geologist, Handyman, Naturalist, Outdoorsman, Readyman, Scholar, Scientist, Showman, Sportsman, and Traveler. Each activity badge is a colorful metal emblem that you pin on your Webelos colors (ribbons) on your right sleeve). 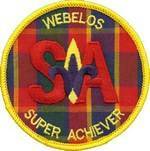 For the Webelos badge, each Scout needs to earn three activity bages, each one from a different activity group. One of the badges must be Fitness and one must be Citizen. After you have earned the Webelos badge (three activity badges), you will work to complete four more activity badges (for a total of seven) to earn the Compass Point Emblem. After you earn the Compass Point Emblem, you will receive a metal compass point to pin on the Compass Point Emblem for each additional four activity badges you earn. Scout, or he may join a troop at age 11 (or when he completes the fifth grade). The Arrow of Light is presented at a formal ceremony. If you earn all 20 badges by the Arrow of Light ceremony, you will earn the distinguished Super Achiever patch and have your name engraved on the PACK 318 Super Achiever plaque for all to see for generations to come.